So much of our time is devoted to food - we work so we can buy food, we spend hours making food, we go to the grocery store 1-3 times a week, and then we spend time eating 3+ times per day (most of us anyways). For the most part, that's fine, cause food is awesome. BUT, wouldn't it be nice if we could devote more time to eating the food then the other stuff? I'm talking especially about grocery shopping. I have 3 kids and between my wife and I, we spend about 2-3 hours per week at the grocery store. What can you do in 2-3 hours? Watch a movie? Clean the house? Exercise? Get some extra work done? More sleep?...Now you can eliminate that wasted 2-3 hours per week walking around the grocery store trying to find where-the-heck the water chestnuts are located. Yeah, I wouldn't say Walmart is my favorite store, but it has all the basics and it's usually priced okay. 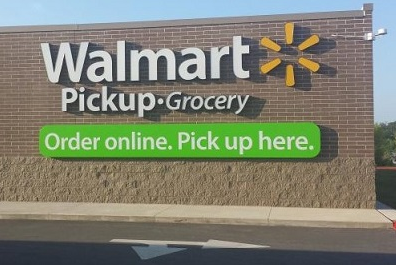 However, Walmart's new service, "Pick-Up" is a game changer. 3. Pick up your groceries at their "Pick-Up" location. You don't even have to get out of the car! Wow, how do you bet that? Yes, some grocery stores have home delivery and that's pretty cool, but you'll pay for that home delivery. I've done this a few times and I have to say, this is how I'll be doing my grocery shopping 90% of the time from now on. No more searching the isles for those water chestnuts. You have to place your order in advance, some times the day before. So there you have it. Going to give it a try? Don't find this a game changer? Here is a link if you want to give it a try. You'll get $10 off your first order. If you have referral code, feel free to share it in the comments for others.